Affix Scientific simultaneously leverages both the power of science and technology to contribute to some of the most interesting problems in Life Science research. Our company couples chemistry and innovation with the principles of sustainability to help address a myriad of different global issues in the fields of enzyme inhibitors, agonists, antagonist, signaling tools, ion channels and more. 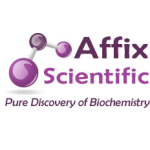 Affix Scientific’s industry-leading portfolio of bio chemicals products, chemical reagents, and research reagents delivers an extensive variety of technology-based products and solutions in high growth sectors such as pharmaceutical, life sciences, agrochemical and chemistry-related industries.